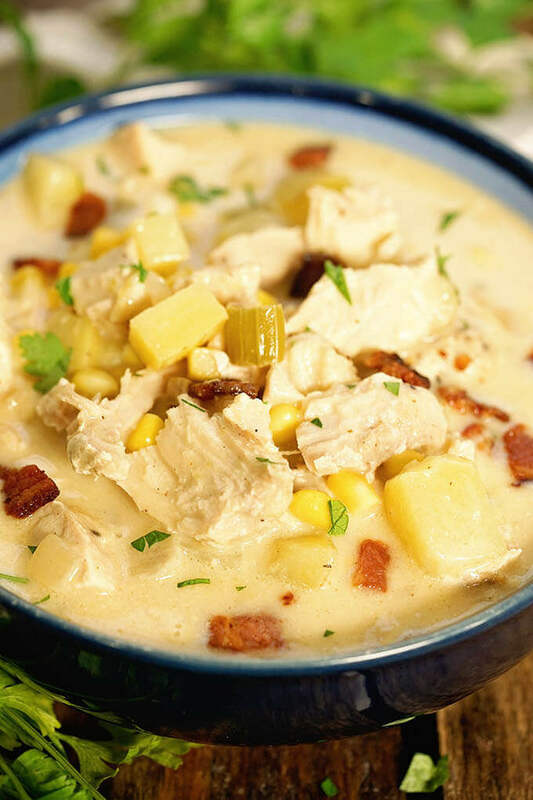 Turkey Chowder with Corn is a hearty, delicious soup! Don’t toss your holiday leftovers! When you grow tired of turkey sandwiches, transform leftover turkey into a rich delicious Turkey Chowder. No turkey? No problem! Rotisserie chicken works just as well. I ain’t gonna lie… I love the day I have planned! I’m doing some decorating for the holidays. I have another pot of Turkey Corn Chowder on the stove, some dinner rolls in the oven – life is good! Yesterday I had the BEST brainstorming session with my buddy Jessica in Sacramento. I shopped for some fun Christmas Ornaments and bought 20 pounds of mandarins. It was a wonderful day! It’s not very often you can steal some time for yourself and just do your own thing. Truly, I feel blessed! I also love a meal that I can pull the ingredients out of the pantry & freezer and make something completely spectacular. Like THIS chowder! Start by sautéing the bacon. Dice it into small chunks (lardons). Put the bacon in a cold pot (use the same one you’re going to make the stew in – no need to dirty another dish) and THEN turn the pot on over medium heat. Starting it off in a cold pot will help render off the fat. Cooking the bacon should take about fifteen minutes. Remove the bacon bits with a slotted spoon and put them on a paper towel to drain. While the bacon is cooking, dice the onion, celery and the potatoes. If you use russet potatoes, I recommend peeling them. Yellow or red potatoes, no need to peel – just scrub them well. After you remove the bacon, pour out most of the grease, but reserve all those brown bits in the bottom of the pan. Add the butter & olive oil, then the onions and celery. Cook for about 4-5 minutes until they just begin to soften. Then add the potatoes and minced garlic. Cook for another minute or two. Add the flour and cook that for a couple minutes also. Then it’s time to add the Tabasco sauce (don’t be afraid of the heat, Tabasco adds a great flavor!) and chicken stock. When you add the chicken stock, take a spoon and scrape up all the bits off the bottom of the pan. They are going to give you big flavor!! Increase the heat to high and bring everything to a boil. Cook until the potatoes are tender. Next, ladle about half the soup into the Blender . Blend until creamy and smooth. Add it back into the soup pot along with the turkey and corn and heat through. Remove from the heat and add in the half & half. Sprinkle with chopped parsley and serve. This easy chowder serves a crowd, but can easily be cut in half for smaller families. How do you thicken corn chowder? I thicken this chowder with flour and by blending it. You can eliminate the flour and blend a larger amount of the soup to thicken it if you choose. Want all of my soup making tips and tricks? Check out Homemade Soup; A Complete Guide. What if I don’t have any turkey? No turkey, no problem! Use leftover cooked chicken. Here’s what you need to know…. this chowder is AMAZING! Big and bold, over-the-top flavor! Again… don’t be afraid of Tabasco – it makes this chowder pop! A great tip from a reader is adding cream style corn instead of frozen corn. It helps thicken the soup and adds a touch of sweetness! Have more leftover turkey? Give my Turkey Pot Pie Recipe a try – delish! This chowder takes about 40 minutes from start to finish. If you’re looking for an easy dinner idea for tonight, this is the meal! 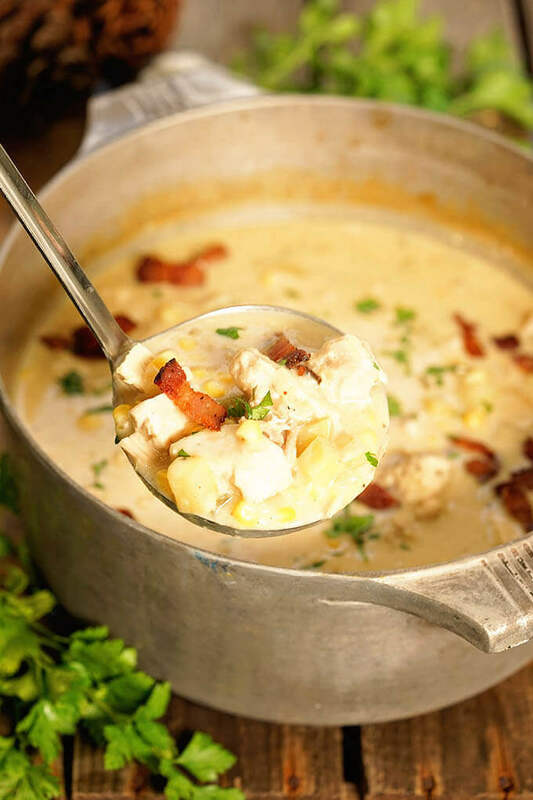 More Great Chowder Recipes I know you’ll LOVE!! Silicone Pad – I love how versatile these pads are! Pot holder, spoon rest, etc – plus dishwasher safe? Hoping Santa brings me a set! Don't toss your holiday leftovers! 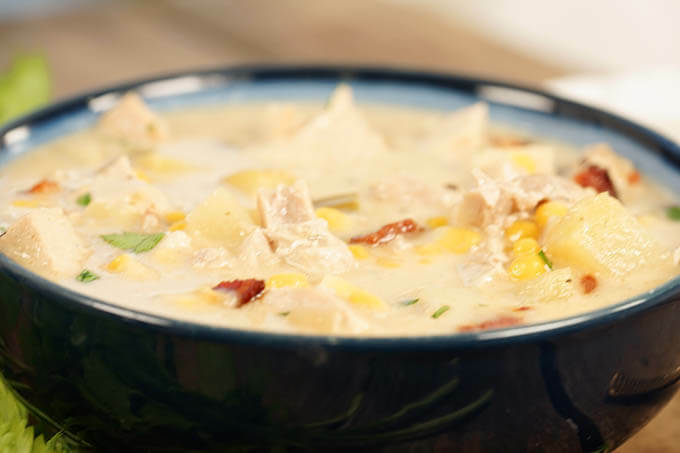 When you get tired of turkey sandwiches, transform that turkey into a rich delicious Turkey Corn Chowder. No turkey? No problem! Rotisserie chicken will work just as well. Dice the bacon and add it to a large stockpot. Cook over medium heat until crispy, remove from pan. Drain on a paper towel - set aside. In the same pot used to cook the bacon, drain off a bit of the oil. Add the butter & olive oil and the onion & celery. Season with salt and pepper. Saute over medium heat until softened, about 4-5 minutes. Add the garlic and saute another minute. Stir in the flour & mix it well with the softened veggies - cook another two minutes. Add in the potatoes and give the ingredients a couple good stirs. Add about 1/4 cup of the chicken stock. Stir everything really well, scraping all of the browned bits off the bottom of the pan. Add the remainder of the chicken stock, increase the heat to high and bring to a boil. Reduce to a medium heat, stirring occasionally, the mixture will thicken.. Cook for about 10-12 minutes or until the potatoes are soft. Add the turkey and corn. Stir well to combine. Turn off the heat add cream & bacon, stir to combine & warm thru. I love a dash of Tabasco to finish off the chowder! Now's the time to add it! Another favorite quick and easy soup is 20 Minute Chicken Noodle Soup! Or if you’re looking for a delicious side to go along with this soup – cornbread. Always so yummy! * Yellow frozen corn (rather than white) is my choice making this chowder. The yellow corn gives it a bright POP of color, love that! 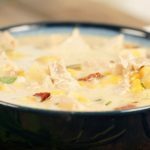 Turkey Corn Chowder is an easy soup that you make from leftovers. Using a few things items from your pantry, fridge and freezer. This is a great way to use leftovers. I have always wanted to try a vegetarian version of corn chowder and maybe someday you can make one for me? 🙂 Your recipes and photos, as always, are enticing and delicious. You betcha Rini, I’ll be working on that, YUM!! Thank you so much for stopping by! This just look fantastic. Can’t wait to try it and looks so easy to. I hope you try it soon, we sure enjoyed it! I bet you will too! Well this is a keeper! Went to MIL’s for Thanksgiving so I actually have a whole turkey in the freezer right now. Probably going to make it next week so of course with the leftovers this recipe is going to come in handy. I am rating it already at a 5 star because it just looks fabulous and tasty and perfect for a cold day here in CA. Awesome, you are set then Diana! It’s a cold day here too – great day for a bowl of soup! Oh I am going to have to try this one! Looks so comforting! Yes, comforting and delish – please come back and let me know what you think Suzy! I can’t get enough soup this time of year! Thanks for sharing this one! You bet – enjoy Mary! I love chowders and smelling them cooking on the stove on a cool winter day 🙂 It’s also great to make time for yourself. We all need that to re-group. I think taking time for yourself is always a tough thing, especially around the holidays. I hope you enjoy this soup Stephanie! I love chowders..most any kind. I’ve made corn/potato chowder for years…never any recipe. The results are always tasty. It never occurred to me to add turkey. This will be my go-to chowder. Easy to adapt to gluten free and versatile. It won’t let me give the 5 stars it deserves. 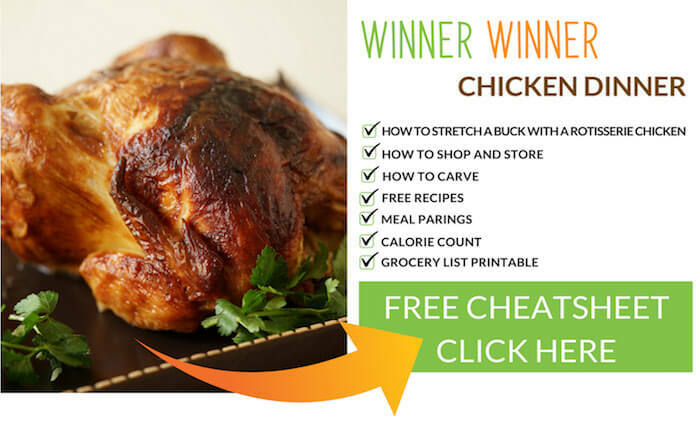 I just love the turkey version – so hearty and delicious. I hope you enjoy too after adapting it for gluten free!! Thanks for stopping by and enjoy your day Amanda’s! This soup would taste good any time of year! I like the addition of Tobasco! Just enough to make it interesting,. Yes, I totally agree Dan, when I don’t have turkey I sub the rotisserie chicken, just as delish! This sounds like a great combo I would never have thought of. The bacon will be great for flavor and sticking to your ribs in cold weather too. Yum! I hope you give it a try Scarlet, the whole family will just love it! This looks incredible — I’m a sucker for anything “chowder” — big chunks of potato and turkey in a creamy, thick chowder base! Yum! Yup, I’m with you! Definitely a stick to your ribs kinda meal! We always make corn chowder with our turkey leftovers, so yum! Very smart, great way to repurpose leftovers!! Great way to use leftover turkey! This looks yummy! Thanks Evi, we just love this chowder! Your chowder sounds wonderful and comforting and I love how easy it is too. I am featuring it at the Let’s Get Real Weekly Link Party this Thursday! Thank you so much Patty for featuring it this week! Hope things are well your way – I’ll swing by and link up this week. I really appreciate the feature! Delicious. I made it tonight with leftover turkey I had in the freezer. It was creamy and thick without a raw flour taste. My husband has a LVAD and is waiting for a heart/kidney transplant. He has to have a low sodium diet so we can’t open a can of soup. This was so easy and flavorful we didn’t miss the salt. Thank you for sharing. How exciting Nancy, I’m so glad you enjoy this soup! But more importantly, my thoughts and prayers go to you & your husband. It sounds like you have some very challenging times ahead. My thoughts and prayers are with you. This soup is great! I did something a little different that I wanted to share. I had leftover creamed corn from my Thanksgiving meal that I used instead of frozen corn. It turned out delicious! It added some extra creaminess, which was good because I also only had half and half leftover from our meal. I also added a little extra Texas Pete (instead of Tabasco) to give it a tad bit of heat. Thanks for sharing! Great additions Whitney! I love cream style corn and I know that would taste just fantastic! Thanks so much for letting me know! Oh, I love chowders! And this one is the ultimate for the cozy winter dinner! Loving it so much! So easy and so good, thank you Liza!! !